Appearance: He usually adorns a simple but sleek black kimono with a grey hakama that has black vertical pinstripes. His hair is very odd being that it is an off white color, which shimmers with a tint of purple once the glare of the sun hits it. This is odd mainly because he is from the Uchiha Clan which are known for having dark/black hair. Personality: Kotetsu is a staunch rebellious anarchist who sees chaos as the only acceptable world order. Which means that naturally, he doesn't do well woth authority figures. Willing to disrespect or possibly even attack anyone acting as his superior. He is willing to destroy anyone who stands against him and resorts to extreme measures in his campaign to accomplish his personal goals. However, he is not indiscriminately violent, as he shows no desire to needlessly attack others who pose no threat to him or his ideals. At the same time, he genuinely cares for the people he trusts, especially if he considers you his friend,whom he treats as equals even though he is their leader. Mainly because in his eyes if you are his true friend then you are his family. He feels the need to blame the shinobi alliance and world leaders to be the cause of the greatest imbalances in the world. Kotetsu holds the belief that disorder is the only true order, a philosophy that promotes chaos and pandemonium as the true attributes of freedom and individuality. History:Here begins the story of the young shinobi known as Kotetsu Sakkaka Uchiha. Although before we can unfold his life, we need to talk about his parents a little bit. His father was Ookami Uchiha, a fabled shinobi that descended from the leaf anbu, Reknowned for his mastery over his dojutsu and genjutsu as well as his undying loyalty to his village and people. 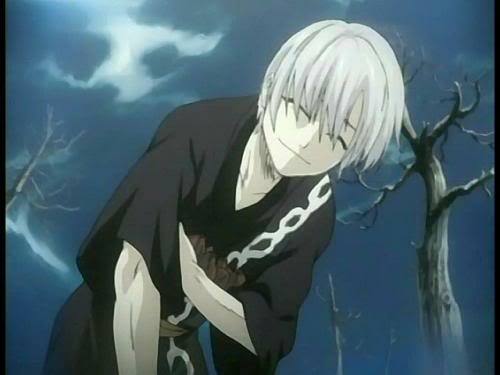 Yet something changed the moment he met a woman from a royal family affiliated with the Mist Village. A mystifying long-white haired beauty, known simply as Kitsune. From the rumors he was appointed to guard the families caravan as they traveled through dangerous territories to settle tension between the leaf and mist. Although no one is for sure how they truly met yet they do say it was love at true sight. Soon, Ookami began to sneak off from the Leaf village in order to meet Kitsune on an island in secret. Which as time went by, the secret meetings began to happen more frequent. Also the two of them began to conspire on running away together. Eventually they did as they planned and hid away on the island that they had their secret meetings on and built a house. To where they conceived a child, which was a healthy pale haired boy. From there they began their new life and family, happily and proudly. To where everything seemed to be going perfect, up until the boy's ninth birthday when the family was attacked by a group of hired mercenaries. They were caught off suprise which resulted in his mother and father being slaughtered and him being captured by being knocked unconscious. When Kotetsu came to, his hands were bound up above him in a small building. His ribs felt bruised, face bloodied, and he could feel the tears seeping forth, the sight of his parents being murdered played out over and over, repeatedly through his head. At this moment in time, he felt as if it was all over for him. Like there was nothing to live for, being that he was just a child, now with no family. A man now entered the room with a blade in hand. There was nothing that stood out about the average built man except that he had an unusual tattoo on his right forearm. It was hard toals make out but as he approached, Kotetsu could see it resembled a dragon or serpent. Although that was really the farthest thing from his mind at the time, instead he couldn't help but to continue and feel no hope or will to live on. When all seemed lost, a faint voice seemed to echo through the mangled and wild thoughts. He wasn't able to comprehend it nor did he care, but then it continued to repeat itself. It also become louder and louder with each repetition. The voice was that of his fathers, saying something that his father drilled into his head. "You are an Uchiha, a prideful and determined Clan." The voice now rang clear, "So do not be afraid, for there is nothing to fear but fear itself." There was a brief pause before the sound of his fathers voice went from comforting to seriousness, "Instead face the fear without hesitation and the death of it is certain." The man now took the Kunai and made small cuts all over Kotetsu's upper chest which was to simply cause pain since they didn't once try to speak with him. Although the boy was being cut, he didn't seem to react. Instead he now remained there motionless, the tears ceased to flow, and Ko had his eyes closed. It was as if he was blocking out all distractions and focusing on the voice. "The fear of death follows from the fear of life. A man who lives fully is prepared to die at any time. So always remember that courage is perfect sensibility of the measure of danger, and a mental willingness to endure it. For Courage, above all things, is the first quality of a warrior. So if you fall down, get back up. If you fall behind, run faster. Never give up, never surrender and always rise up against the odds. Pursue one great decisive aim with force and determination." The voice seemed to temporarily fade before booming one last thing, "You are an Uchiha, so if the enemy calls for blood then the only way to secure peace is to prepare for war!" With that Kotetsu's eyes flickered open, revealing his Sharingan Tomoe-1. His eyes now radiated with the murderous intent to kill, just a flash from the eyes made the young boy seem Demonic. His bloodlust for revenge clouded the room making it feel stuffy or uneasy. The man, which was cutting into the boy, now stopped has his anxiety was rising and paranoia started to set in. This was the weaker form of the Coercion Sharingan. The man's breath became heavier as he glanced rapidly around the room as if he was being watched or hearing something. The wooden walls were making a wretched eerie groan as if about to collapse which was all just a figment of his imagination, or fabricated by the genjutsu. As the man looked searched around the room, he didnt necessarily drop his guard, but he did quit paying attention to Kotetsu. So in turn the young boy decided to take advantage of the situation, for he knew it could very well easily be his last. In a quick motion, Ko swung his right foot in a vertical motion, which in turn struck the hand that wielded the knife. It was dislodged from the bandits hand and sent straight into the ceiling, but not before cutting the rope that held him slightly suspended. The moment his feet touched the ground, the boy lowered his stance and went straight into a spinning right heel sweep. The quick moves of the young shinobi caught the man by suprise, causing him to fall on his back. Before the man could get to his feet, Kotetsu leaped upwards with his hands still bound together. At the peak of his jump he dislodged the Kunai from the ceiling and brought it down with both hands into the mans chest. The wound was deep and fatal but didnt seem to kill him instantly, instead it punctured a lung and caused him to drown on his blood within a couple minutes. The blood filling his lungs restricted him from calling out for help. Kotetsu couldn't help but to feel pleasure in watching the man suffer and gasp for air, seeing that he believes this gang to be behind his parents death. After the man passed the sharingan faded from his eyes as did his adrenaline from his body. The pain now setting back in as he felt the warmth of his blood seeping from the small open wounds. He was only able to stumble out of the small house and into the street, of a small village outside of Kirigakure, before passing out. It was there that a elderly couple found him and took him in there home. It was there that they tended to his medical needs and gave him medicine for pain and to aid with sleep, but by the time he awoke, he was located inside an average house in Kirigakure. There a man told him of what happened after he passed out. That the couple saved him and snuck him there for fear of his life. Reason being is that the village is actually under the control of the gang that took his parents life and kidnapped him. From there the man helped Kotetsu train and grow stronger. Soon he even enrolled the boy into the Academy in order to further his education and abilities. It didn't take to long for the young boy to grow accustomed to the way of the mist shinobi.He became very adept at using his Sharingan, mainly for genjutsu, and his new teacher/guardian has been teaching him kenjutsu. Not long after that the boy graduated from the Academy at the age of 12 to where he became a genin. For the next 3 years, he focused on perfecting his Sharingan, as well as kenjutsu. It was at the age of 14 did he gain his Sharingan Tomoe 2, and now a year later he is still attempting to perfect his kekkei genkai and physical abilities, as well as to accomplish his personal goals. First ; You say his age is 12, but at the end of your history he is 15. Second ; You say that the Mist Village is controlled by the gang that killed your character's parents. That would be difficult considering the Mizukage is only six-nine years older than your character. No the small town that he was taken to is controlled by the gang. The town is outside of Kirigakure. Also I am sorry about the age I will edit now.